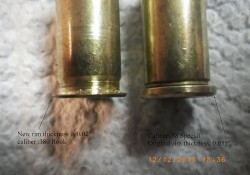 The caliber miked out to just under 36, while the case dimensions were very similar to that of the .38 Short Colt except the rim thickness is only 0.02″, so I realized it was a .380 Rook, aka 380 Ely, or .380 Webley or a variation of. The problem of course is actual new .380 Rook ammunition, even in Europe, has not been available anywhere for a very long time, and inside the US probably not for about a century. That meant I needed to make some ammunition from scratch, unless I wished the pistol to be a non-functional paperweight even if it is in very good shape.